The spirit of Christmas is in the air, so that means it’s time for Christmas decorations to come out of their boxes to be vibrantly hung on trees, homes, and throughout streets. For some, decorations can be as simple as hanging a reef on the front door. But for others it is a production, the opportunity to “deck the halls” with over –the-top themes, lights and figurines so extraordinary they can be deemed as tacky and seem as though they could be seen from space. Here is a list of places to see the most over-the-top Christmas displays across the U.S. Tacky Lights Tour, Richmond, Va.
Richmond, the capital of Virginia is far from tacky with old city charm of streets, parks and cozy neighbors, which showcase the city’s eventful past. However as the Christmas holiday approaches, this beautiful city transforms into a lights-frenzy as neighbors, friends and family –basically the entire community –compete with the most outrageous Christmas decorations, giving the town the repute for its Tacky Lights Tour. So extreme, this spectacle has its own mobile site: www.tackyrichmond.com and even offers limo service for spectators who would like to attend this annual tradition in style. Significantly noted as the “Largest Holiday Light Show West of the Mississippi”, The Winter Wonderland stretched along the Portland (Ore.) International Raceway is a drive-through parade of vibrant colors, characters, and themes that attract millions of visitors since 1993. Some of its displays include the 12 Days of Christmas as well as the scene of Santa jumping on a ski slope from 84 feet in the air. During the Christmas season Seattle's Olympic Manor community comes to life with a brilliant light display. Its insane Christmas decorations brings many onlookers who are hypnotized by the gigantic Santa displays, numerous glow-in-the-dark candy canes, and brilliant colors of twinkling reds, blues and greens brightening up the streets. Christmas at the Fischer’s Place, Plymouth, Minn.
Home to the Fischer family, this outstanding light show offers a dazzling presentation of over 5000 computer generated lights with the sound of Christmas music ricocheting through the air. With the message of bringing Christmas cheer to its audiences, the Fischers remain one of the must-see attractions of the Twin Cities. The Garabedian Family Christmas House, Bronx, N.Y. The Garabedian Family brings a whole new meaning to the word insane with their Hollywood and festive dancing figurines. Have you ever seen a Nicole Kidman or Elizabeth Taylor doll for a Christmas display? Well you will with this family. Almost every nook and cranny of their New York home bursts at the seams with life-size characters and ornaments. From Saint Theresa to the Virgin Mary, you will be amazed by the sights of these festive ornaments. So intricate is this holiday production, the family has to dissemble and resemble the display of the main stage every night and evening. Hyatt Extreme Christmas, Fort Lauderdale, Fla. Since 1990, the Hyatt Family has elaborately decorated their home for the holidays to spread that good old Christmas cheer. From Nov. 29 to Dec. 28 gazers can explore the Santa and Mrs. Clause Workshop room, land of Snow White and gigantic M&M figurines, and children can ride Yoffi the horse (one of Santa’s sleigh team members). The Trail of Lights, Branson, Mo. Paired with holiday music, the Trail of Lights is a tradition that never seems to go out of style in Branson, Missouri. Adorned with millions of colorful lights, life-size characters (some 3-dimensional) and festive displays such as “Trail that Nobody Knows How Old” give a whole new meaning to Christmas decorations. There is also a glass elevator that takes visitors 230 feet to capture a panoramic view of the Christmas spectacle. Bellingrath Gardens Magic Christmas in Lights, Theodore, Ala. The spirit of Christmas is definitely in the air in Bellingrath Gardens magic Christmas Lights. This fascinating presentation lures a multitude of onlookers who are spellbound by the lighted trains, dragons, trees and flowers. Once a private home, its 65 acres of garden space beautified with poinsettias and about 3 million lights and thousands or decorations is a favorite among those who witness its spectacular illuminations. Stroll down the 700 block of 34th Street, also known as Christmas Street by locals in Baltimore to bask in the glory of light-frenzy. 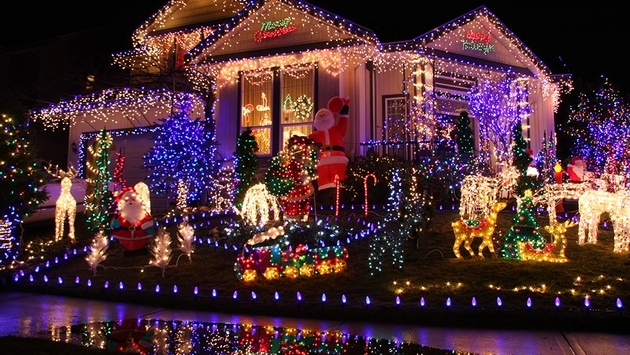 Every year its residents exceed expectations with vivid decorations of their houses, which includes with an excessive amount of ornaments, lights, hub cap Christmas trees, as well as Christmas greetings and characters for their visitor’s amazement. Such a phenomenon is this display, vendors set up shop along the streets with delicious snacks for watchers wanting a snack while staring at the dazzling production. Dyker Heights Christmas Lights & Cannoli Tour, Brooklyn, N.Y.
Cruise down the Italian American section of Dyker Heights in Brooklyn to see a sparkling light competition like no other. The residents here take pleasure in luring visitors and locals alike with their traditional and nontraditional intricate decorations. From mechanical reindeer, glowing nativity scenes to towering soldiers and audio-visual Christmas presentations- here too much is considered a good thing.